Bathtubs have evolved from your loving grandfather’s conventional cast iron claw foot to the trendy pedestal tubs that add elegance to any bathroom. They combine design with function and therefore, are in trend these days. 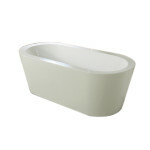 Free standing tubs offer you an uncomplicated bath, especially when you want to enjoy a relaxing break. Whether you are constructing a new house or are considering a major bathroom renovation, our ergonomically designed free standing bath tubs are sure to be the most valuable addition to your private place. 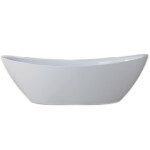 Our tubs are designed to offer you extreme convenience and simplicity. They are ergonomically designed to support your body’s natural curves so that you can enjoy a relaxing bath for long hours! 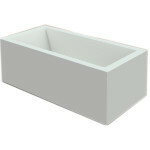 They are available in wide range of sizes, materials, and colours to suit every budget and every bathroom configuration. You can install them anywhere and not necessarily near the wall. They are supported by decorative bases that add elegance to them. Install them at the middle of the bathroom and create a Hollywood style look! Our free standing bath tubs are manufactured with high gloss and high quality material that give them bright and shiny look. They are sure to jazz up any bathroom, no matter how old or new it is. They are seamless. The entire body is one piece construction; there are no joints. We never compromise durability, so be assured that all of them are going to last for years without any significant maintenance. While they have their own charm, they also have a highly practical use. Just water and you; this is all you need to enjoy a relaxing bath in them. Unlike the cast iron tubs, they have thermo-retentive properties and therefore, they can retain the heat of the water for a long time, thereby ensuring you a longer and warmer bath time. They are ergonomically designed and therefore, are sure to relax your body and even your soul. Every bathroom is different and so are its needs. 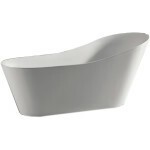 Our stunning collection of ready-to-use free standing bath tubs is available in all popular sizes and designs. However, if you are after a specific design, colour, or size that isn’t readily available, do not hesitate to discuss your requirement with us. Being one of the oldest and largest manufacturers of bathroom supplies in Sydney, we are sure we will be able to create a customized piece for you. Having a state-of-the-art manufacturing unit, we can manufacture just any number of free standing bath tubs in any specified time. Our fast turnaround time makes us the preferred choice for builders, strata developers, hotels, etc. We always have a good stock readily available in our warehouse and therefore, can assure you minimum waiting time. 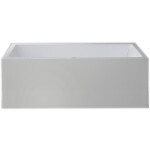 We manufacture bathroom supplies in bulk and therefore, have successfully minimized our overheads. This is the reason why our free standing tubs are highly affordable. Further, we give lucrative discounts on bulk orders. Call today at 02 9675 6885 and discuss your requirement with us.